I recently re-discovered my slow cooker. But this time I was on a mission to find some delicious, unique recipes that didn’t call for a lot of processed ingredients. I was pleasantly surprised to find Martha Stewart’s Chicken Curry recipe. The version below is my adaptation. In a 5-quart slow cooker, toss chicken, onion, garlic, ginger, red bell pepper, curry powder, coriander, and cumin to coat. Season with 1/2 teaspoons salt. Cover, cook on high setting until chicken is fork-tender, about 4 hours (do not uncover while cooking). 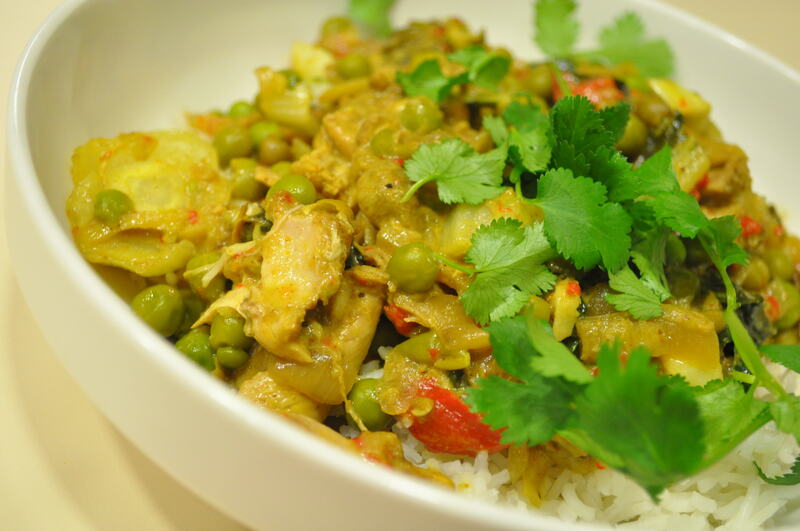 Stir in coconut milk and peas; cover, cook until peas are heated through, about 20 minutes. Transfer chicken to a large bowl; shred with fork. Return to pot; toss with sauce. To serve, garnish with 1/4 cup fresh cilantro leaves, if desired, and serve over freshly cooked basmati rice.